Is grain free pet food any better for your dog or cat? At Pet Camp we see all sorts of pet food, from our all natural house brand, to “top shelf” (or at least expensive) brands, to grocery brands. The trend these days is to see lots of grain-free pet food. When you’re taking care of 180 dogs and 80 cats you expect to see all sorts of pet food and it makes you wonder if there is something to be said for the grain free trend. Unlike fillers that provide little or no nutritional value, whole grains contribute vitamins, minerals and essential fatty acids to pet foods. It turns out that some grains also provide protein in a form that some pets find easier to digest then the proteins in meat. 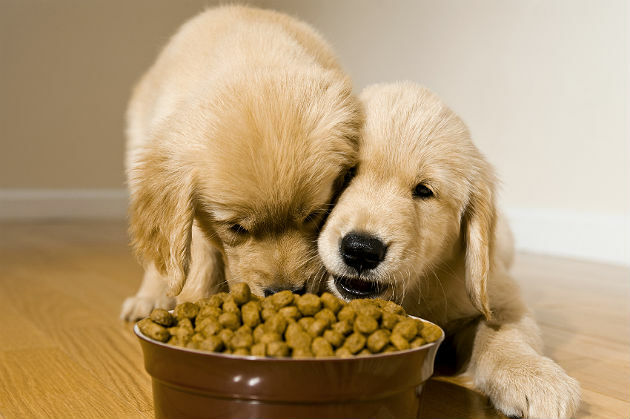 Also, more than 90% of dogs and cats can utilize and digest the nutrients in grains found in pet food. Grain free pet foods often have carbohydrates from other sources. Turns out that some of these sources, such as sweet potatoes, have a higher carbohydrate level than corn. Substituting grain with beans, peas, or lentils may not reduce the carbohydrate level in the food, and depending on what is substituted for grain, the resulting food may end up with more fat and calories than food including grain. Food allergies remain generally uncommon in pets, with less than 1% of skin issues and less than 10% of all allergies being food related. While a pet may have a food allergy, it is more likely to be an allergic reaction to the animal protein (for example chicken, beef or lamb) in the food rather than the grain in the food. Gluten intolerance is very rare in dogs and nonexistent in cats. So where does this leave us? According to this article (notwithstanding the marketing blitz of grain free pet food to pet parents), perhaps just like with humans, the focus should be on an overall nutritious and balanced diet rather than on one item within that diet. But what do you think? Have you transitioned your dog or cat to a grain free diet? If so, what prompted you to make the change and have you been pleased with the results?